Ichthyosaurs were large marine reptiles that lived through most of the Mesozoic Era. They seem to have evolved from a group of terrestrial reptiles (a group which is still to be identified) during the early Triassic period, about 245 million years ago, initially looking rather like lizards with fins. 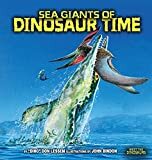 Ichthyosaurs continued to evolve during the Triassic period, and both dolphin-like and somewhat serpent-like forms existed, the latter sometimes growing to huge sizes, as much as 50 feet (15 meters) in length. By the early Jurassic period, Ichthyosaurs had reached their peak of diversity, and a long slow decline in diversity continued through the Jurassic and into the Cretaceous period. The last Icthyosaurs finally became extinct during the middle to late Cretaceous, perhaps about 90 million years ago. 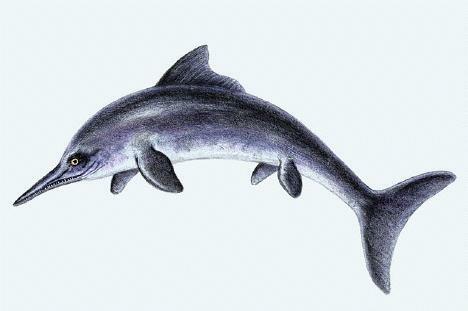 In outward physical form, Ichthyosaurs tend to resemble whales, dolphins or sharks. This is a result of convergent evolution - sharks, cetaceans (whales, dolphins and porpoises), and ichthyosaurs all evolved similar body shapes, because it is a good hydrodynamic solution for swimming. One difference between Ichthyosaurs and many other marine predators, is that it is believed that Ichthyosaurs probably hunted by sight (rather than for example echo-location). Part of the evidence for this is that Ichthyosaurs generally had comparatively large eyes - one particular genus of Ichthyosaur, namely Temnodontosaurus which lived in Jurassic Europe and was about 30 feet (12 meters) long, had the largest eyes of any known vertebrate - its eyes were 10 inches (26 centimeters) in diameter. Another noteworthy fact about Ichthyosaurs is that at least some species, perhaps even all species, seem to have given birth to live young. The evidence for this is that fossils have been found of Ichthyosaurs containing fossils of babies within the abdomen. It has been suggested that perhaps these babies were stomach contents and therefore evidence of cannibalism, however it seems more likely that these fossils show a pregnant Ichthyosaur that died just before (or perhaps even during) giving birth. Fossil fragments of Ichthyosaurs have been known since at least 1699, however the the first complete fossil specimen was found by Mary Anning in 1811 in Lyme Regis, England (Mary Anning subsequently discovered three species of Ichthyosaur). A large number of other fossils were also found by a 1905 expedition to central Nevada, including a 55 foot (17 meter) Shonisaurus (a very large, late Triassic Ichthyosaur), which since 1977, has been designated as Nevada's State Fossil. On the 21st of May 1799 a baby girl was born to Richard and Mary Anning, Lyme Regis, Dorset. The daughter was christened Mary and she grew up to become one of the most famous fossil hunters of her age. She collected and studied fossils found in the surrounding cliffs of the Jurassic coast. Mary’s contribution had a major impact when scientific enquiry was leading to a change in the way people thought about the evolution of life and our planet - a story that would culminate with Charles Darwin's; ‘On the Origin of Species', published in 1859. This is a factual history of England’s most famous fossil hunter Mary Anning and her major finds, which included ichthyosaurs, plesiosaurs and a pterodactyl. It also includes notes on other major pioneering palaeontologists of her time, including William Buckland, Henry de la Beche and William Conybeare, who were her friends and mentors. The author Nigel J. Clarke, a life-long resident of Lyme Regis, has also written “Lyme Bay Fossils”, the best selling guide to the fossils of the Jurassic coast. In the summer months he conducts regular guided fossil hunts along the same cliffs and beaches as Mary Anning once frequented. Provides information on the characteristics and life of the dinosaur known as Ichthyosaurus. This detailed guide was developed in association with the Park. Berlin-Ichthyosaur is home to North America's largest concentration of Ichthyosaur (large marine reptiles) remains, and the historic ghost town of Berlin and Union, Nevada. Side 1 features a trail map of the park along with photos and text describing points of interest. Side 2 has historical notes about Berlin and vintage photos plus charts of features in the town. The map is 18.5" x 26", printed two sides, folded to a handy 4" x 9" and printed on waterproof, tear-resistant material. Our journals and planners are great for popping in your bag or having in your workspace or desk at home to grab when that special little thought comes to you and ensure you get the things you think about done! Suitable to be used with most media, pencils, pens, felt tips, watercolours, pastels and perfect for creating collages and artwork ideas. Criticism about the neo-Victorian novel ― a genre of historical fiction that re-imagines aspects of the Victorian world from present-day perspectives ― has expanded rapidly in the last fifteen years but given little attention to the engagement between science and religion. Of great interest to Victorians, this subject often appears in neo-Victorian novels including those by such well-known authors as John Fowles, A. S. Byatt, Graham Swift, and Mathew Kneale. This book discusses novels in which nineteenth-century science, including geology, paleontology, and evolutionary theory, interacts with religion through accommodations, conflicts, and crises of faith. In general, these texts abandon conventional religion but retain the ethical connectedness and celebration of life associated with spirituality at its best. Registering the growth of nineteenth-century secularism and drawing on aspects of the romantic tradition and ecological thinking, they honor the natural world without imagining that it exists for humans or functions in reference to human values. In particular, they enact a form of wonderment: the capacity of the mind to make sense of, creatively adapt, and enjoy the world out of which it has evolved ― in short, to endow it with meaning. Protagonists who come to experience reality in this expansive way release themselves from self-anxiety and alienation. In this book, Glendening shows how, by intermixing past and present, fact and fiction, neo-Victorian narratives, with a few instructive exceptions, manifest this pattern.